In the following guide, you will get more familiar with the Assets section of the InPlayer Dashboard. The Assets section is going to be where you’ll do most of your work. It has three tabs: Assets, Packages and Vouchers. InPlayer, as a digital monetization tool, uses assets as a way of protecting your digital content. A simple way to understanding assets is to think of them as the box you put your content in to protect it. So, you create your asset, you put your content in it, you set a price for it, and you put the asset on your webpage. With that, the only way for anyone to get to your content is to log into the asset and purchase a pass. Once they do, instead of seeing the asset, they will see the content fully displayed in the same spot where the asset used to be. Everything happens within the same page. Next, you have the button for creating a new asset. We’ll get to that in a moment. On the right, you have the search bar, along with the option to choose whether to view a list of the active or deleted assets. So, if you wanted to find the asset with the title Big Band Night, you’d click on the search field, type in title, press Enter, type in Big Band Night, and press Enter again. Finally, you have the main part of the Assets tab, which is the table where you can see the basic details about your assets. To open an asset, just click on the button on the right, under the Action column in the asset’s row. Creating an asset is a quick and easy process. Since we offer multiple types of assets, make sure to check out this section to learn about how to create the asset best suited for your setup. 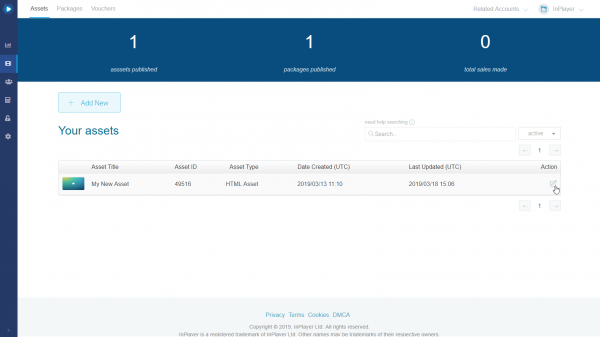 Note that the HTML asset is our universal asset and you can use it to protect pretty much any web-based content. If you can’t seem to find the guide appropriate for your setup, feel free to contact on support@inplayer.com. Right next to the Assets tab, you will find the Packages tab. Our platform offers the ability to combine multiple assets into a bundle, which can then be sold under one price. We call these bundles Packages. 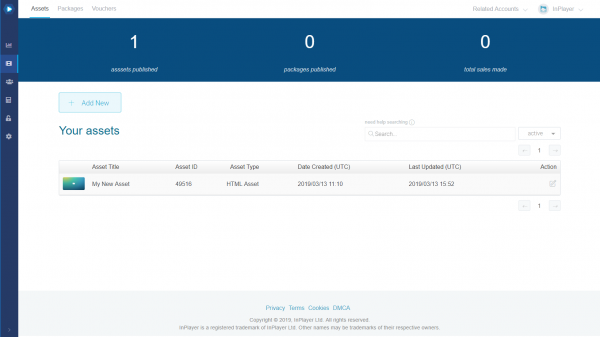 Once the customer purchases a package, they will automatically have access to all assets that have been placed in that package. Note that packages themselves are not embedded on a webpage. The asset is still the thing you need to embed on your page because that is where the actual content is located. 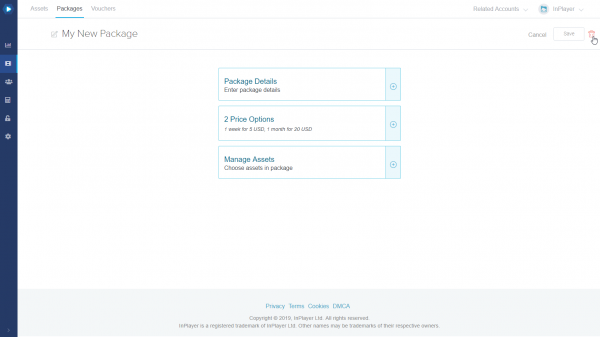 The package only serves to bundle multiple assets under a single price. 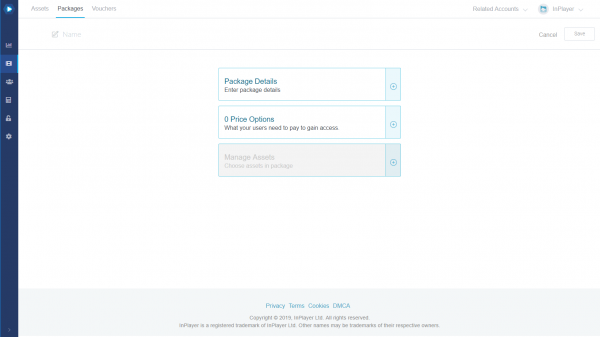 When a customer clicks on an asset that is a part of a package, the package price will appear in the asset’s price options, and by selecting it, the customer will get access to all assets that are part of the package they’ve just purchased. 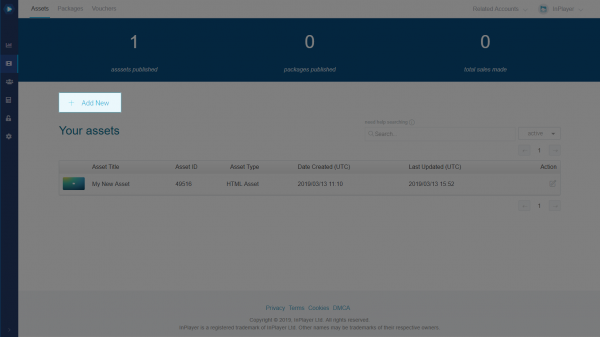 To access the assets, the customer will need to navigate to the place on your website where the assets have been embedded. On the right, you have the search bar, along with the option to choose whether to view a list of the active or deleted packages. So, if you wanted to find the package with the title Big Band Night Package, you’d click on the search field, type in title, press Enter, type in Big Band Night Package, and press Enter again. Under the search bar, you have the main part of the Packages tab, where you can see all the packages you’ve created. 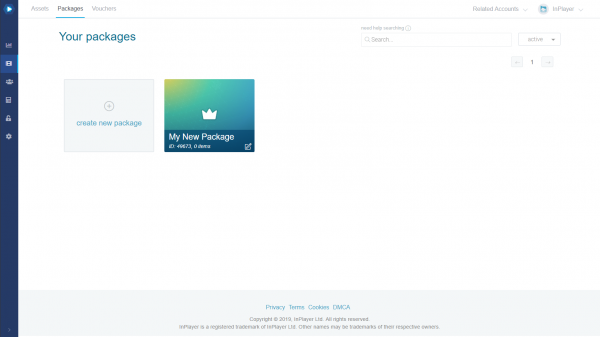 This is also where you create new packages, by clicking on the create new package button. We’ll get to that in a moment. To open a package, just click on it’s button. 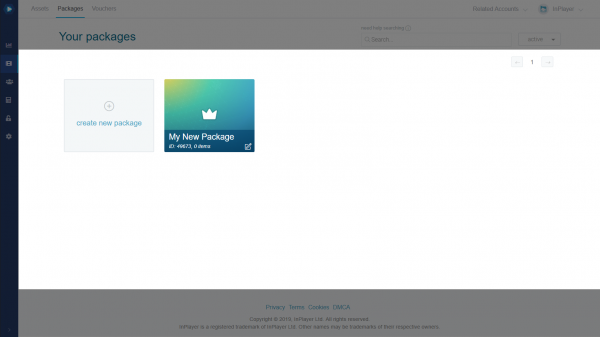 To create a package, click on the create new package button. You will be presented with the package creation page. In the Name field at the top, enter a name for your package. 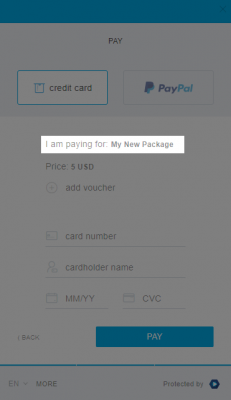 This will appear on the final payment form on the paywall, as well as the notification emails your customers will receive. In the Package Details block, you can add a description for your package. This will also not be shown anywhere on the paywall, unless you use our older Paywall V1 interface, in which case it will be shown on the final payment page where the customer enters their credit card details. If you use our new V2 interface (and we recommend that you do), you can leave this blank. In the Price Options block, set up the pricing. This will be the pricing that will appear on all assets that are going to be included in this package. 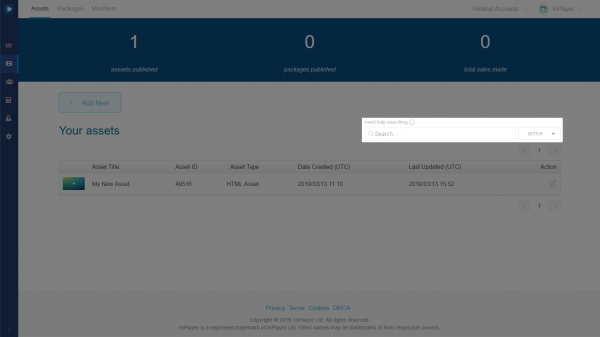 You will notice that the Manage Assets block is greyed out. This is because you will need to save the package first. Do so by clicking on the button. 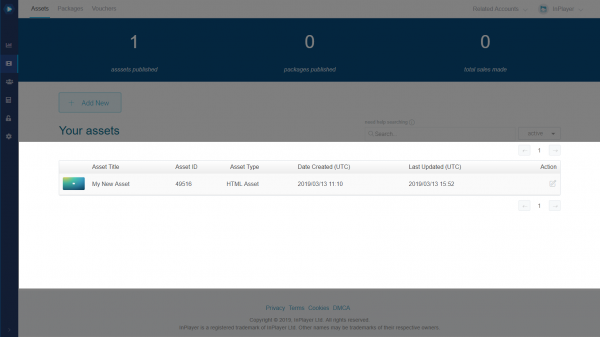 As soon as you do, the Manage Assets field will become available. Here you can add the assets you wish to include in the package. You can add as many assets as you want. When you’re done setting everything up, click the button at the top right. To delete a package, just open it, and click on the button at the top right. You can always bring a deleted package back by going to the Packages tab, selecting deleted from the drop-down menu next to the search field, and clicking the Reactivate button on the package you want to bring back. Then go back to the active packages list, and the package will be there. 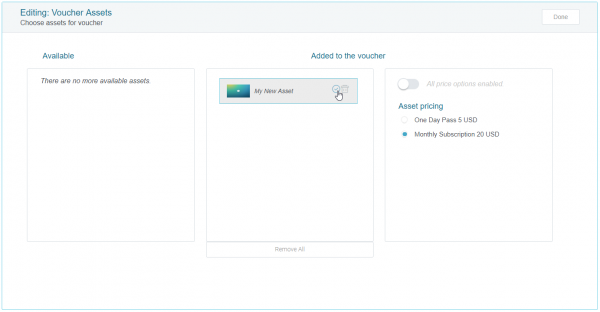 The final tab in the Assets section is the Vouchers tab. A voucher is a code that allows your customers to get a discount on a payment. Next, you have the button for creating a new voucher. We’ll get to that in a moment. Bellow that, you have the search bar. So, if you wanted to find the voucher with the code Discount80, you’d click on the search field, type in code, press Enter, type in Discount80, and press Enter again. Finally, you have the main part of the Vouchers tab, which is the table where you can see some basic details about your vouchers. To open a voucher, just click on the button on the right, under the Action column in the voucher’s row. 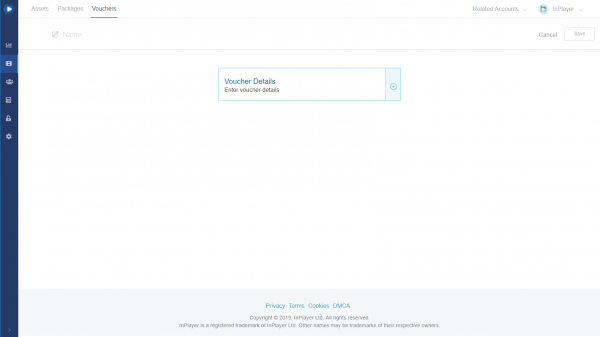 To create a voucher, click on the button. In the Name field at the top, enter a name for the voucher. This will be the title that will appear in the voucher list. The customer will not use or see this. In the Voucher Details block, set up the voucher. This is the code the customer will need to enter to get the discount. You can set up a custom code or a randomly generated one. This is the discount the customer will get by using the voucher. You can set it up to 100 which means a customer will not have to pay anything at all. Note that you only need to enter the number of the discount percent, without the % sign after it. This one is only applicable for subscription payments. once – gives a one time discount on the first payment for a subscription. forever – gives a permanent discount for all future payments for a subscription. repeating – gives a discount for a set number of payments for a subscription. This is how many times can the voucher be used. 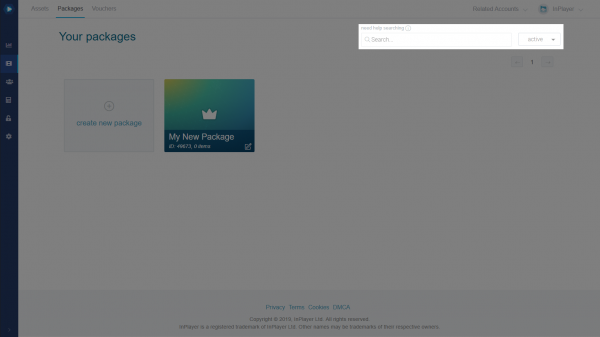 The default is set as blank, which means a voucher can be used an unlimited number of times. Set the Dates and Start and End times. This sets the voucher validity period. Note that the times are in UTC. Once you set everything up, you can save the voucher by clicking at the top right. With that, your voucher has been created and is ready to be used. 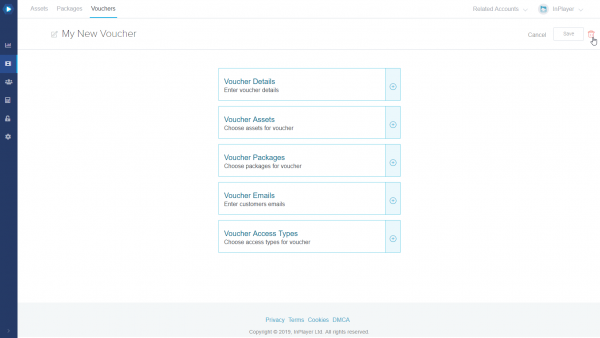 However, note that in its current state, the voucher can be used by any customer, for every asset and package you have. If you wish to limit the voucher validity and make it valid for only a certain asset, or package, or price option, or to make it so only a certain customer can use it, you can proceed to modify the other properties that will appear as soon as you save the voucher. 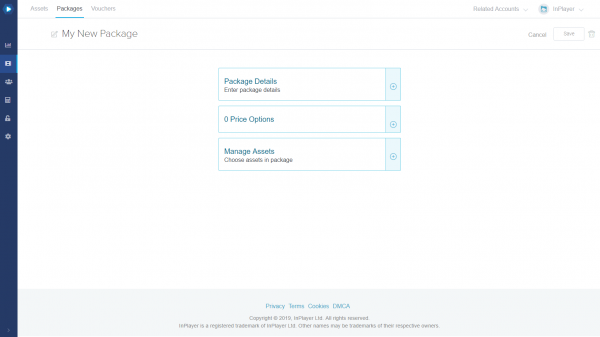 In the Voucher Assets and Voucher Packages blocks, you can select for which assets and/or packages can the voucher be used. 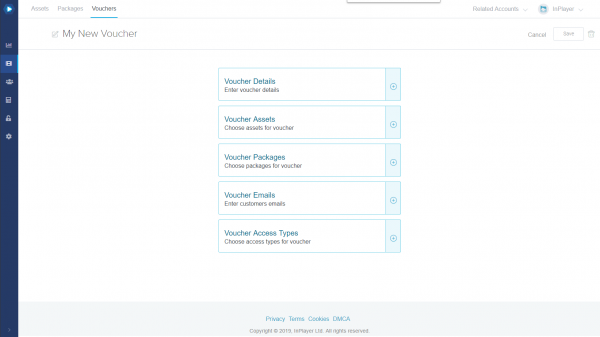 Just click on the button next to the asset or package you want to add to the voucher. You can even go one step further, and specify for which price options will the voucher be valid, in case your assets or packages have multiple price options set up. To do this, just disable the All price options enabled slider, select the price option you want to enable, and click the button on the asset. 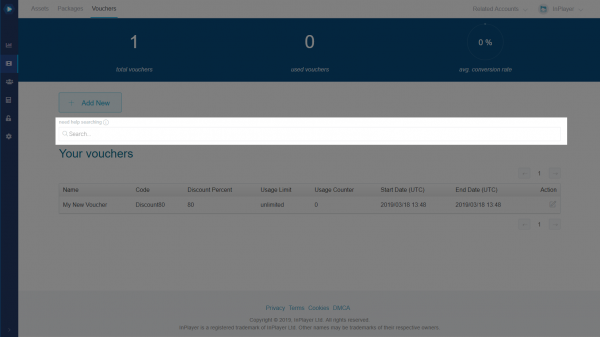 In the Voucher emails block, you can choose to assign the voucher to only a specific set of customers, so that only they can use it. To add a customer, just type in their email address and click the button. Note that a customer doesn’t have to exist in the database. You can set up the voucher now, and when the customer registered with the email you’ve entered, they will still be able to use the code. In the Voucher Access Types block, you can make the voucher valid for only ppv or subscription price options. If you want the voucher to be valid for both, just leave this option as is, i.e. select neither the ppv or the subscription types, which will make the voucher valid for both. To delete a voucher, just open it, and click on the button at the top right.